The Geological Evidences of the Antiquity of Man. London: John Murray, 1863. Charles Lyell was the foremost geologist in England in the 1850s, and his reluctance to accept the evidence for human antiquity offered by the Abbeville flints and the Engis skull no doubt influenced many of his contemporaries to reject it as well. So when Lyell converted to a belief in human antiquity in this book, it was a noteworthy event. 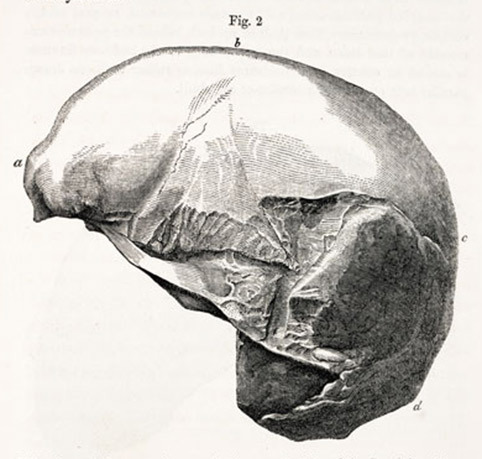 Lyell resurrected the Engis skull in print—the first to do so—as well as the Neanderthal skull, and he argued that the stone tools found in Abbeville, Amiens, and Brixham were probably made by ancient humans like the Engis or Neanderthal peoples. Lyell’s book was read by many outside the geological community and did much to spread the word that humans had lived on the earth for a long, long time.